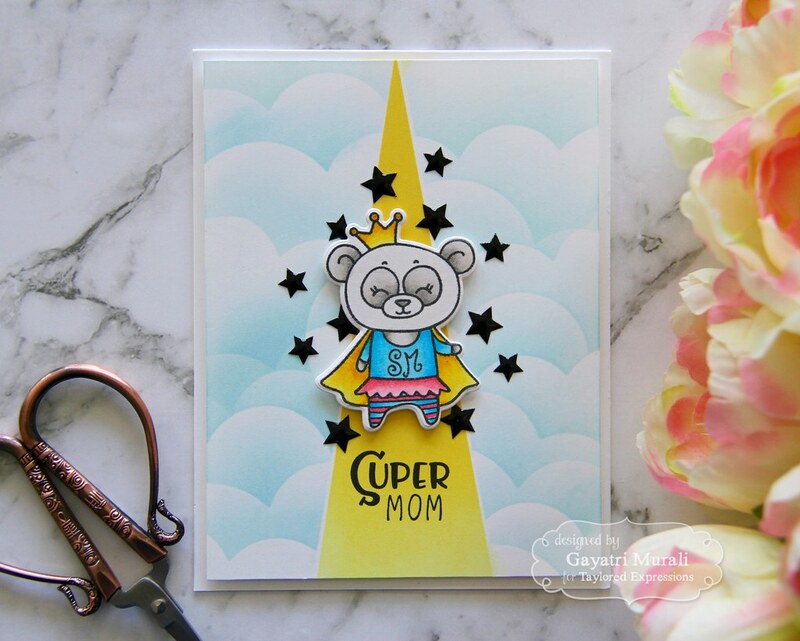 I have a mother’s day card to share with your today using Taylored Expressions newly release SuperMom stamp and die combo. 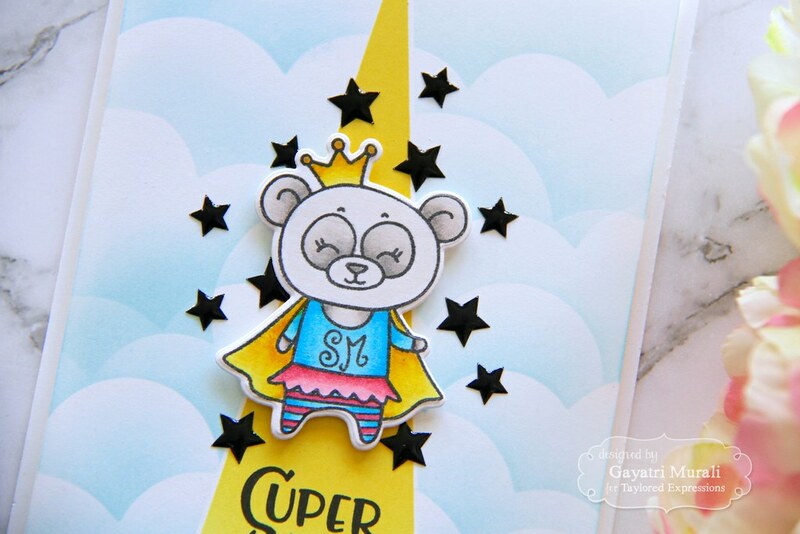 I adore this panda image with the crown, cape and super woman dress. Super cute! 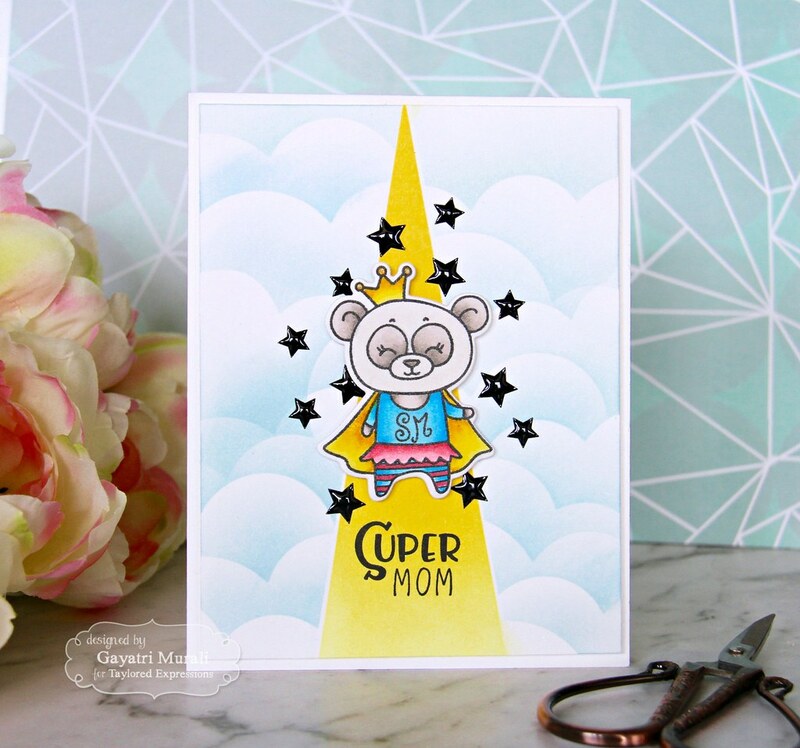 I wanted the image to be the highlight on the card because it is mother’s day. I did some masking to create a background that would highlight the focal image. I trimmed a masking paper to the size of the card front. Then trimmed a “V” piece from the top centre to the bottom. Adhered the side piece on the Sugar Cube card front and sponged Lemon Meringue TE dye ink to get a light ray effect. Then masked the sponged area to sponge clouds using Build A Scene Rolling Clouds die mask and Sprinkles TE dye ink. I then stamped the sentiment using Oreo hybrid ink on the bottom of the yellow light ray. Adhered the Panda Super Mom image using foam adhesive above the sentiment. Then embellished Oreo enamel shaped star randomly around the image. I think this card turned out wonderful and I love it. Hope you do too. All the supplies used to make this card are listed below. Thanks for stopping by my blog today. Have a lovely week.